Have you Heard? Year of the Bird! National Geographic in collaboration with Audubon, Cornell Lab of Ornithology and Bird Life International is celebrating the 100th anniversary of the Migratory Bird Treaty Act that has saved so many birds but is currently under attack at the national level. Additionally, more than 100 other organizations that work to protect birds and their habitat have joined the campaign. Each month these organizations will feature stories about birds, conservation efforts and how you can help. Read about why birds matter. Take the pledge and then #BirdYourWorld! Litter is not for the birds! Join us on February 11th. Duval Audubon Society is partnering with St. Johns Riverkeeper and the City of Jacksonville to do monthly cleanups at parks in the Jacksonville area, and this month's cleanup will be at the St. Augustine Road Fish Management Area on February 11th. St. Augustine Road Fish Management Area is a hidden gem for nature lovers. The lake and surrounding woodlands are a haven for many different species of birds and other wildlife, but unfortunately it is in dire need of a cleanup. Please join us to spruce up this beautiful area! Be sure to check our website or Meetup page for future monthly outings. We can help make a better environment! The Great Backyard Bird Count (GBBC) is an annual four-day event that engages bird watchers of all ages in counting birds to create a real-time snapshot of bird populations. This year the count will take place from Feb. 16 – 19. Participants are asked to count birds for as little as 15 minutes (or as long as they wish) on one or more days of the event and report their sightings online at www.birdcount.org. Anyone can take part in the Great Backyard Bird Count, from beginning bird watchers to experts, and you can now participate from anywhere in the world! We are offering an organized field trip for the GBBC on February 17th. It will be at Cedar Point Preserve, 7116 Cedar Point Road in Jacksonville, so join us for that as well. It's free, fun, and easy. Each checklist submitted during the GBBC helps researchers at the Cornell Lab of Ornithology and the National Audubon Society learn more about how birds are doing, and how to protect them and the environment we share. Last year, participants turned in more than 144,000 online checklists, creating the world's largest instantaneous snapshot of bird populations ever recorded. Visit the official website at www.birdcount.org for more information and be sure to check out the latest educational and promotional resources. Teams on our Jacksonville Christmas Bird Count combed the area looking for birds during our recent annual count. The results are in and volunteers tallied 152 species! Thanks to all who participated in this important citizen science project. 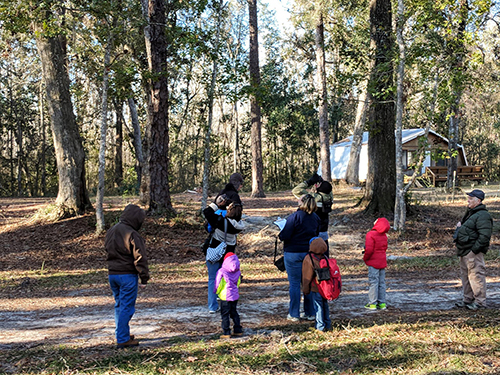 Then on a cold wintery morning after our adult count, Duval Audubon held its 4th Annual Christmas Bird Count for Kids (CBC4Kids). 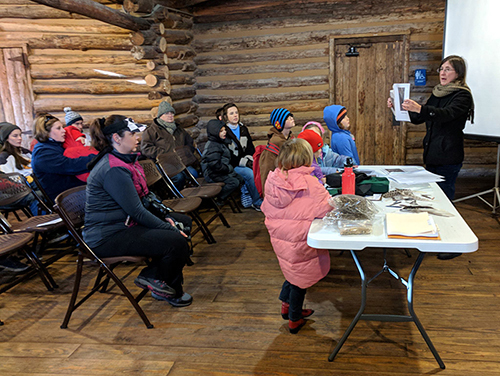 Approximately 30 children bundled up and ventured out to Camp Chowenwaw to participate in the program designed to introduce kids to nature and birding. The day began with Duval Audubon member Carolyn Antman introducing birding and binocular boot camp. The kids then split up into teams with experienced naturalists to explore the park, finding birds and other wildlife along the way. By the end of the field trip, the kids had spotted a Red-shouldered Hawk, Blue-headed Vireo, Yellow-throated Warbler, Red-bellied Woodpecker, Orange-crowned Warbler, Yellow-bellied Sapsucker, Black-and-White Warbler, Ruby-crowned Kinglet, along with other common species. In total, the kids spotted 32 different species of birds. The morning ended with a W.I.L.D. program by the Jacksonville Zoo Ambassadors. The Ambassadors introduced the kids to a Red Rat Snake, Armadillo, Yellow-naped Amazon Parrot and baby American Alligator. 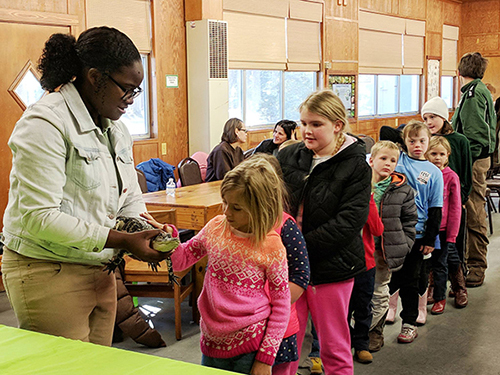 Along the way, they presented an interactive, educational and entertaining program that allowed the kids to view wildlife up close and personal. A big thank you to our sponsors: Camp Chowenwaw and Clay County Parks, Jacksonville Zoo Ambassadors, Publix, and Wild Birds Unlimited of Julington Creek, and to our volunteers who made this possible: Debi Hill (Coordinator), Carolyn Antman, Carol Bailey, Aurelie Drexler, Martha Fethe, Dave Foster, Pete Johnson, Denise Jump, Stacey Kowlsen, Brett Moyer, Pat Murphy, Jean Rolke, Robert Sanford and Ann Stodola. Sign up for The Advocate, a once-a-week publication by Audubon Florida during the Florida Legislative session that will keep you up-to-date on what’s happening in the Florida government concerning conservation. Bills being introduced in the House and Senate, and the Audubon take on these bills are discussed as are any measures you can do to help influence your Legislators. Sign up now by going to Audubon Florida. Enter your email address at the bottom of their home page.The Advocate will come directly to your email every Friday. On January 27 the NE Florida Regional Conservation Committee (RCC) met at Silver Springs State Park to discuss conservation and review chapter progress in meeting the Regional Conservation goals set at Audubon Assembly in October. The seven NE Florida chapters all had representatives at the meeting. Anyone interested in becoming involved in Duval Audubon conservation activities, please contact our Conservation Chair Andrew Schumann at drewgschumann@gmail.com, or Vice-President Carolyn Antman at akeylady123@gmail.com. Carolyn is also on the Audubon Florida(AF) Board and serves as the AF Chapters Committee representative at the RCC meetings. February Program, February 19, 2018, 6:30 p.m.
Did you know that the Mocama-speaking Timucua of northeastern Florida were among the first natives of mainland North America to be described by Europeans? The maritime or Mocama dialect of the Timucuan language was spoken by Native Americans along the Atlantic coast of northern Florida and southern Georgia. These coastal Indians bore the brunt of European colonization in the 1560s and became part of Spain’s Catholic mission system in 1587. This presentation discusses the Mocama Indians and reviews excavations by the University of North Florida at Mocama Indian villages and missions.